"The high accelerations of Mystrium strikes likely result in high-impact forces necessary for predatory or defensive behaviours," the researchers wrote in a report of their findings in the journal Royal Society Open Science. "These ants are fascinating as their mandibles are very unusual," said University of Illinois animal biology and entomology professor Andrew Suarez, who led the research with Fredrick J. Larabee, a postdoctoral researcher at the Smithsonian National Museum of Natural History and Adrian A. Smith, of the North Carolina Museum of Natural Sciences and North Carolina State University, Raleigh. 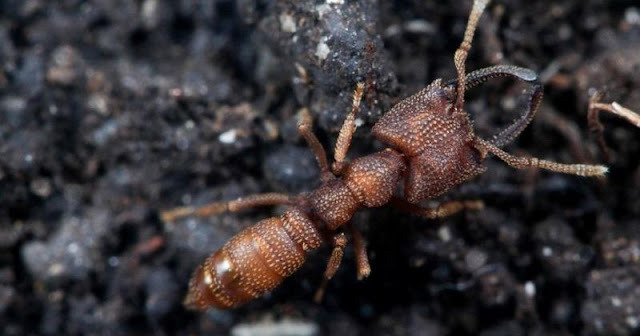 "Even among ants that power-amplify their jaws, the Dracula ants are unique: Instead of using three different parts for the spring, latch and lever arm, all three are combined in the mandible." The team's future work includes examining how the ants use their mandibles in the field. "Their biology, how they capture prey and defend their nests, is still in need of description," Smith said.